Exciting Times! 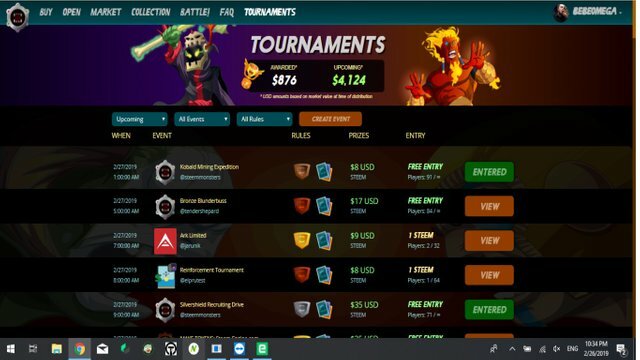 Automatic tournaments are live in Steem Monsters Beta! For those who have thought for a long time whether to join the game or not I want to say that the game itself is a lot of fun, highly addictive and in early stages, so it gives good opportunity to start building your deck early and be ahead when the mass adoption wave comes. It is a good investment since every card you get is unique recorded on the blockchain and your property so it can be gifted or sold at any point. For the 10 USD that costs the starter pack to be able to play the game, everybody gets 25 random cards, 5 from each of the Splinters in the game (excluding Dragons, which is of itself a special splinter) Life, Earth, Fire, Water and Death. 5 summoners - 1 each and 4 cards from each splinter. So you already have value for the 10 bucks you put, in case you decide to sell you way out of the game at any point. Picked up your interest? You can register for the game here. Not exciting enough yet - read on! This for example is a free tournament I have enrolled for tomorrow morning (2/27/19) that offers 25 STEEM reward for the winner. And this is just one of the tournaments. And yeah I do understand that it takes time and spending some money to build up a competitive deck, but as I mentioned earlier at the moment the cards are selling supper cheap so with a 20-30 usd one can build a good competitive deck, maybe even 2 splinters (always good to have a backup splinter due to the random nature of the fight conditions). And yeah, nothing beats free when it comes to the tournaments - Consider it a free chance to win some STEEM! 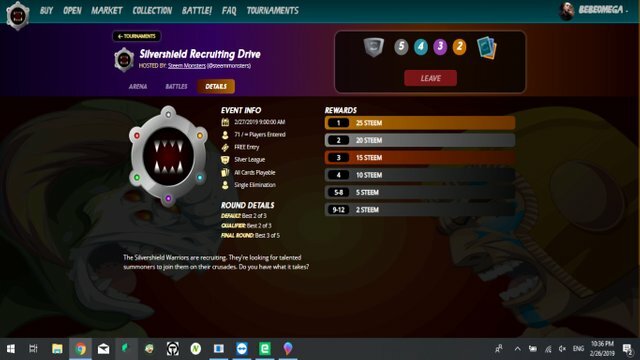 If you decide to give the game (and the new featured tournaments a chance) you can register here or click on any of the pictures in the article. DISCLAIMER: The links for the game all include my referal code and I will appreciate if you support me by joining via it but in case you don't feel like supporting me, you can always head to https://steemmonsters.com and sign up directly, without supporting me. Hello ! This is a friendly reminder that a Partiko user has just followed you! Congratulations! You just got a 0.38% upvote from SteemPlus! It's been a while since I last played STEEM Monsters, glad it still popular but I don't think I'll invest money in it just yet. You made more than 7000 upvotes. Your next target is to reach 8000 upvotes.